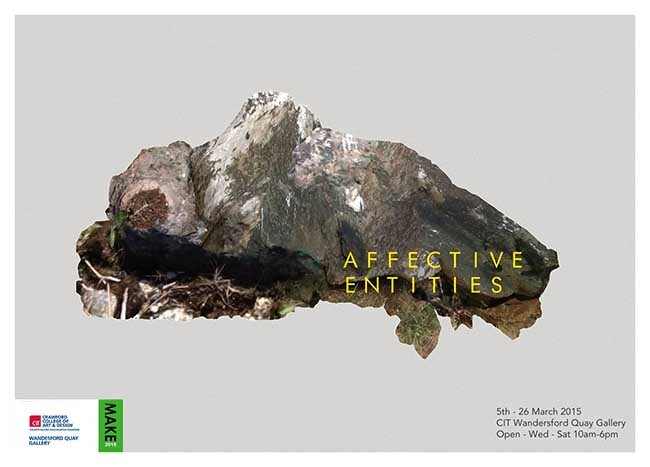 In collaboration with MAKE 2016 Symposium: Objects and Revolution, this exhibition features art objects created by recent graduates of CIT Crawford College of Art and Design (CIT CCAD) as well as the artist Marie Brett, who have been invited to explore how their engagement with materials can manifest ideas of loss, absence and trauma. Affect, in Brian Massumi’s definition, is less a feeling or emotion, but an intensity - a sensory impression which can act as a trigger for profound thought. This exhibition seeks to engage the viewer by incorporating visual, tactile and haptic dimensions to address our fraught histories, endeavouring to create an impression which compels us to look, an encounter which provokes us to interpret, an expression which forces us to think. Marie Brett holds an M.A. in visual art from Goldsmith's College in London, and her work is held in collections both nationally and internationally. Brett has been a visiting lecturer at CIT CCAD, and the Limerick School of Art and Design, has presented her work at numerous conferences and seminars nationally and internationally, and has been selected at the University College Dublin, Social Science and Law, Artist in Residence for 2016. Brett is a visual artist based in Ireland who uses digital media, sculpture and immersive installation to produce artwork as a reflection on contemporary life, with a particular interest in ambiguous loss theory. Her practice involves a social and collective dimension and her approach to collaboration with community and place, to inform and influence the making of new work, has gained international interest. Rachel Doolin is a visual artist residing in Cork, Ireland. She graduated with a first class honours in Fine Art from CIT CCAD in 2015. Since then her work has been purchased by both private and public collectors including Cork City Council and CIT Registrars Collection. In 2015 Rachel was the recipient of the prestigious Taylor Art Award and also the Programme winner of The Undergraduate Awards Visual Art and Design category. Doolin is currently pursuing a six month residency in the National Sculpture Factory. Publications/reviews include Stitch Stories: Personal Places, Spaces and Traces in Textile Art, Cas Holmes, Pavillion Books 2015, Irish Arts Review- Autumn 2015 and Visual Artists News Sheet September 2015. Cassandra Eustace completed an MA in Arts and Process from CIT CCAD in 2013 and completed her BA (Hons) degree in 2012 with various awards including Student of the Year. She has a studio with the Backwater Artists’ Group in Cork city. Eustace recently assisted in the drawing and installation of Sol LeWitt’s Wall Drawing 119 (1971), at the Lewis Glucksman Gallery UCC, and exhibited in Silver part 2, Garter Lane Arts Centre, Waterford, and 5.5.5. 5 Chances at the Firkin Crane, Cork. Pauline Gibbons is a visual artist, currently based in the Backwater Artist Studios, Cork.She graduated with first class honours from CIT Crawford College of Art and Design in 2015. Her work has been purchased by both private and public collections and she has participated in a number of exhibitions to date. For her degree show in June 2015 she was awarded the Cork Art Society Student of the Year Award 2015, a CIT CCAD post-graduate residency award, and the CIT Science Week Award. Carol Healy is a visual artist who is currently based in Cork city (Ire). She graduated from CIT CCAD in 2015. Carol works predominantly with sculpture and drawing. The materials she uses are nature based and site-specific, she engages with the landscape through walking which is a core element of her process. There is an ephemeral nature to her sculpture work which relates to her interest in the perception of time and space, she also explores this through her on-site drawings which document her walks. Mollie Anna King graduated from CIT CCAD in 2010, where she received her B.A. (Hons.) in Fine Art and an MFA in sculpture from the Slade School of Fine Art. Following her degree show, King was awarded the NSF’s Graduate Bursary award. Since then she has been the recipient of the Land Securities Residency Award and the Barto dos Santos Memorial Award. She has recently completed a Per Cent for Art commission for St. Angela’s College Cork, commissioned on the occasion of the school’s significant redesign by O’Donnel + Twomey architects. In December of 2015 King was awarded a prestigious 16 x16: Next Generation Bursary by the Arts Council of Ireland. Sarah Kelleher is an arts writer, the assistant editor of Enclave Review and is currently based in the National Sculpture Factory as part of the programming team. From 2003-2009 she managed the Vangard Gallery, Cork where she was intimately involved in its curatorial, commercial and administrative aspects. She is a PhD candidate with the History of Art Department in UCC where she is researching contemporary Irish sculpture.